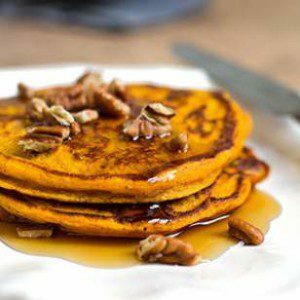 This healthy whole-grain pumpkin pancake recipe produces fluffy cakes with a beautiful orange hue from pureed pumpkin and light crunch from toasted pecans. If you want to experiment with different types of whole grains, replace up to 1/2 cup of the whole-wheat flour with cornmeal, oats and/or buckwheat flour. Or add extra fiber and omega-3s by adding up to 3 tablespoons of ground flaxseed or chia seeds. Whisk flour, baking powder, pumpkin pie spice, baking soda and salt in a large bowl. Whisk egg, buttermilk, pumpkin, pecans, oil, sugar and vanilla in a medium bowl. Make a well in the center of the dry ingredients, add the wet ingredients and whisk just until combined. Resist overmixing—it will make the pancakes tough. Let the batter sit, without stirring, for 10 to 15 minutes. As the batter rests, the baking powder forms bubbles that create fluffy pancakes and the gluten in the flour relaxes to make them more tender. Coat a large nonstick skillet or griddle with cooking spray; heat over medium heat. Without stirring the batter, measure out pancakes using about 1/4 cup batter per pancake and pour into the pan (or onto the griddle). Cook until the edges are dry and you see bubbles on the surface, 2 to 4 minutes. Flip and cook until golden brown on the other side, 2 to 4 minutes more. Repeat with the remaining batter, coating the pan with cooking spray and reducing the heat as needed. 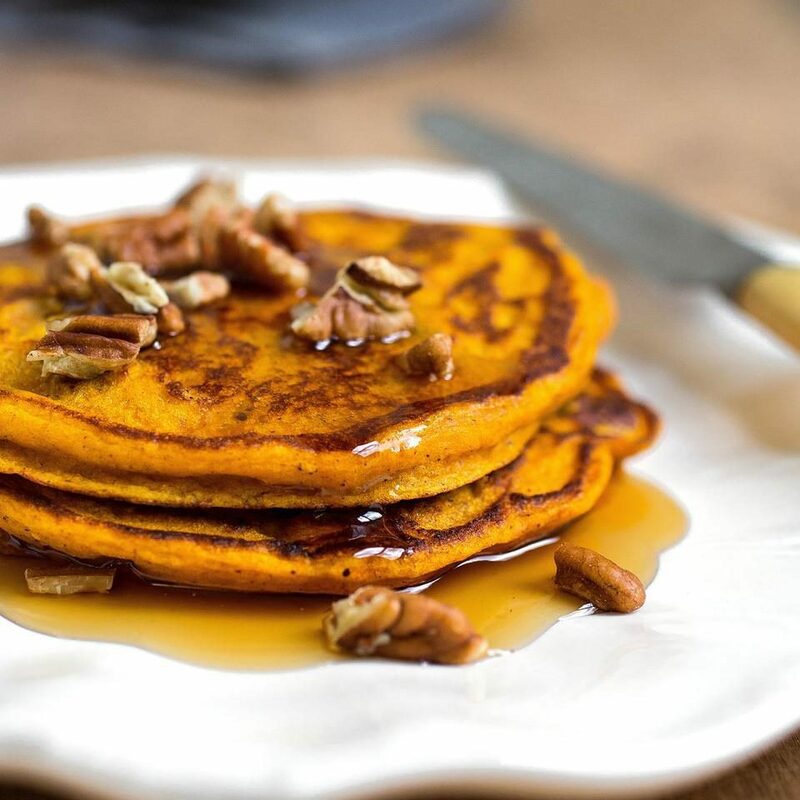 Make Ahead Tip: The mixture of dry ingredients can be stored airtight for up to 1 month; the batter can be refrigerated for up to 1 day; cooked pancakes can be frozen airtight, in a single layer, for up to 3 months. Reheat in the microwave or oven. White whole-wheat flour: White whole-wheat flour, made from a special variety of white wheat, is light in color and flavor but has the same nutritional properties as regular whole-wheat flour. No buttermilk? You can make “sour milk” as a substitute: mix 1 tablespoon lemon juice or vinegar to 1 cup nonfat milk; let stand for about 10 minutes before using. Toasting nuts: To toast chopped, small or sliced nuts, cook in a small dry skillet over medium-low heat, stirring constantly, until fragrant and lightly browned, 2 to 4 minutes. Per serving: 201 calories; 8 g fat (1 g sat, 5 g mono); 29 mg cholesterol; 27 g carbohydrates; 2 g added sugars; 6 g total sugars; 7 g protein; 4 g fiber; 334 mg sodium; 213 mg potassium.